According to a very dear and one of my oldest friends, whom I have recently seen again after a long, long time, this recipe is centuries old, 600 years old to be precise. She has always had a refined taste, especially when it comes to food and she shared a few recipes with me over the years. I don't remember whether I mentioned it before, but about 20 years ago she gave me a recipe for walnut rolls which I was to keep for personal use only. She almost fell off her chair when I told her that I still hadn't shared it with anyone. Yes, that meant that I am officially off the hook, but strangely enough, it still fees like that recipe is not mine to give away. This one, however, was a present, part of her contribution to this blog (yes there is more). It comes from Albania and she picked it up while watching an old documentary. She made it for me when I went to visit, and before I took my first bite, she chatted away how very unusual it was with onion and olives paste wrapped in an orange dough. Pause! Would you hesitate? Because I did. I am very open when it comes to trying new tastes ( I made an avocado cake, remember? ), but at that particular moment, oranges, raw onions and olives, I admit, didn't sound like a winning combination. While she kept talking about that documentary, first thing that came to me was that I never tried anything that came out from her oven that I didn't like. The rest is history. Many hours later, when I left her house, I remember thinking about resourcefulness and ideas that sometimes come with limitations - this recipe is clearly a product of a clever person living somewhere on the Adriatic Sea centuries ago who worked out how to successfully combine what was at their disposal - oranges and olives. I usually write my recipes and leave it to you to decide whether you like it enough to try it or not. In this case I am making an exception and urge you to try this recipe - it's simple, it's vegetarian, takes only 40 minutes from start to finish and above all it's exceptional, for every table and every occasion!! 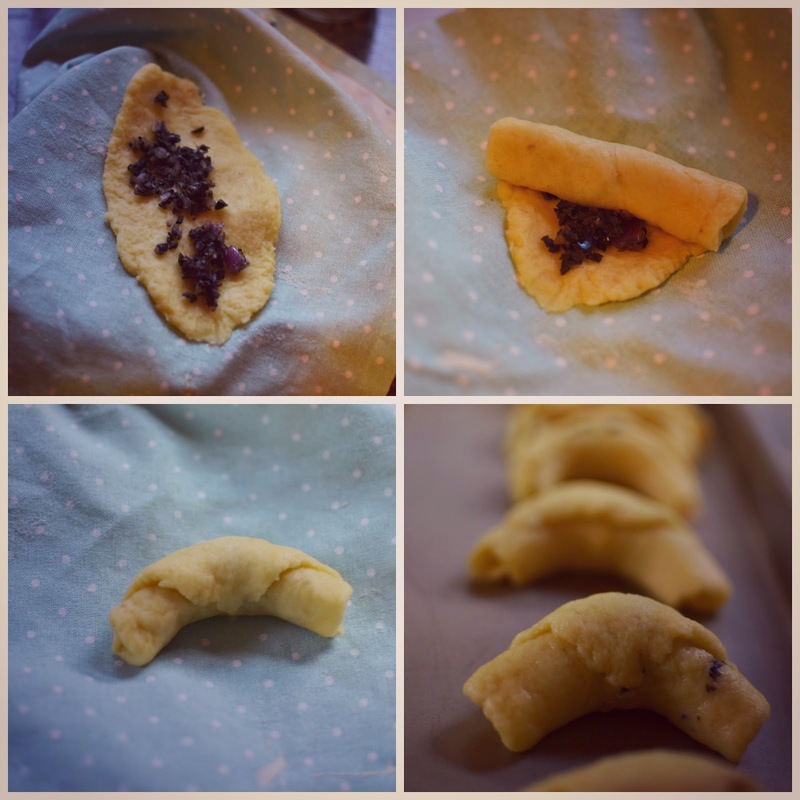 Roll them into an oval shape, and spoon the filling in the middle along long side, then roll the shorter side up, bend into a crescent shape. Prick them with a toothpick and bake in the 180 C preheated oven for 15 -20 minutes, or until light golden in colour.